As an important educational partner of the Westberg Institute for Faith Community Nursing, a ministry of Church Health, Pittsburgh Mercy is an approved provider of the “Foundations of Faith Community Nursing” course. This four-day, 34-hour preparation curriculum is a hybrid course that includes in-person and online learning. The majority of the course modules are taught in person by our approved faculty. The remaining modules involve related, self-directed, online learning. Since 2001, we’ve educated and commissioned more than 400 registered nurses as faith community nurses and hundreds of others – including licensed practical nurses, social workers, physicians, and clergy – as health ministers. Course modules are taught by qualified faith community nurse educators and subject matter experts in the respective fields of practice. Registered nurses who complete the course in its entirety will be commissioned as faith community nurses and receive 34 contact hours and a pin. The cost for registered nurses is $395 per person. In order to receive all 34 continuing education credits (CEs), nurses must complete all required in-person and online learning. Laypersons who complete the course will be commissioned as health ministers and receive a pin and a certificate. The cost for laypersons and others is $200 per person. Course materials, continental breakfast, and parking are included for all participants..
Limited, partial scholarship funds and special group rates for church groups of two or more people are available. Please inquire. The class size is limited to 20 participants. To be eligible for the early registration discount, registration and payment must be postmarked by August 22, 2019. The deadline to register for this event is September 9, 2019. For more information about the Foundations of Faith Community Nursing course, please contact us at 412-232-5815. UPMC is accredited as a provider of continuing nursing education by the American Nurses Credentialing Center’s (ANCC’s) Commission on Accreditation. UPMC and ANCC do not endorse any commercial products as a result of the continuing education (CE) activity. Registration for the Pittsburgh Mercy Health Ministry Dinner & Gathering begins at 5 p.m., followed by dinner and program from 6 to 8 p.m. The event will provide continuing education, resources, and networking opportunities to individuals who are interested in starting or enhancing health ministries in their faith communities, as well as in the general public. Attendees will consider what is working and not working within their ministries, how they can acquire needed resources and people, how they can rejuvenate an established health ministry, and what established programs can help them care for people in need within their faith communities. The gathering is expected to draw parish and faith community nurses, registered nurses, licensed practical nurses, certified registered nurse practitioners, health ministers, clergy, pastoral and social ministers, physicians, health and social service professionals, licensed professional counselors, health care educators, nursing students, seminarians, and others interested in promoting whole-person health. Overnight accommodations are available at the Martina Spiritual Renewal Center, 5244 Clarwin Avenue, Pittsburgh, PA 15229 (West View) at a reasonable cost. For details, contact Sister Donna Smith at 412-931-9766 or at http://martinacenter.com/contact-us/. Registration coming soon. For more information, please contact us at 412-232-5815 or email ParishNurse@pittsburghmercy.org. The Pittsburgh Mercy Parish Nurse & Health Ministry Program offers creative heath ministry workshops and education programs for laypersons and health professionals who want to serve their faith communities. We’ll work with you to prepare programs that will meet the unique needs of your faith community or organization. We’ll also tailor topics to fit your learning needs. Depending on the topic, health ministry education programs can last from two to six hours. We encourage a minimum of 10 participants per program. Health ministry education programs are offered at no cost to faith communities and faith-based organizations. However, to cover the costs of travel, education materials (hand-outs), and advertisement in “The Faith Connection,” our monthly e-newsletter, we gladly accept donations. To design a health ministry education program to meet the needs of your faith community or organization, please contact us at 412-232-5815. 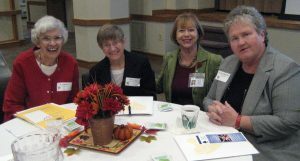 Our Annual Symposium, held on Saturday, October 28, 2017, in Pittsburgh, Pa., and entitled “Celebrating Health Ministry: Our Past, Present, and Future,” was a great success, assisting participants in reflecting more deeply on how we provide wholistic care (whole-person care approach) to those we serve in our faith communities. The symposium celebrated our past in faith community nursing, magnified our present service to those in need, and moved us forward to the dynamic vision for the future of health ministry. 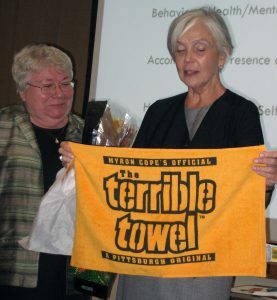 Our wonderful guest speaker, Marlene Feagan, MA, BSN, RN-BC, president of Health Ministries Association, Inc. (seen holding a beloved Terrible Towel), encouraged all 52 attendees to address our own individual callings to health ministry as well as to look honestly at areas needing further discernment and prayer in our faith communities. Marlene also facilitated roundtable discussions to move us beyond our ecumenical boundaries, and intersect faith and health concerns across social avenues focusing on those who are identified with homelessness, addiction, behavioral health concerns, and spiritual challenges. She also engaged us with questions that may not always have answers when it comes to providing wholistic care in faith communities. The spirit-filled room opened and closed with prayer and singing as attendees bonded together. We learned from each other and became better equipped to lead our faith communities through the ministry of healing. As it says in Isaiah 40:11 NIV, “He tends His flock like a shepherd: He gathers the lambs in His arms and carries them close to His heart; He gently leads…”. God’s blessings to you in your ministry! For more information about the 25th Annual Pittsburgh Mercy Parish Nurse & Health Ministry Symposium, please contact us at 412-232-5815. The Pittsburgh Mercy Parish Nurse & Health Ministry Program’s 2019 Spiritual Retreat begins with a continental breakfast at 8 a.m., followed by the opening session at 9 a.m. Lunch is simple with minimum talking, giving time and space for self-reflection. The retreat ends at 4 p.m.
An optional overnight stay on Friday, March 8 includes dinner, fellowship, and evening prayer gathering from 5 to 8 p.m.
Jesus’ command “Love your neighbor as yourself” implies that we love ourselves. But do we? Or are we harshly critical of our mistakes and imperfections? This retreat will draw upon recent findings in neuroscience and psychology, illuminating self-care and spiritual practices that nurture gentleness, kindness, and patience toward ourselves. Far from being self-centered or selfish, these practices also generate deeper understanding of others, enhancing our faith community and relationships. As a bonus, exercising self-compassion aids in reducing stress and inflation while slowing aging in our cells and brains. 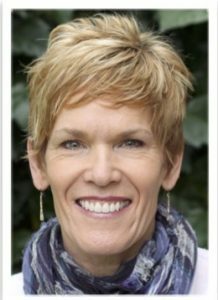 The retreat facilitator is Anne Kertz Kernion, a frequent lecturer on topics blending neuroscience, positive psychology, and spirituality. She is a former adjunct professor in chemistry, environmental science, ethics, nutrition, theology, and world religions at Carlow University and Community College of Allegheny County. A wife, mother, and grandmother, she is also the owner and artist for Cards by Anne, an inspirational greeting card company, since 1986. Participants are invited to a time of prayer, solitude, quiet reflection, learning and fellowship. The annual spiritual retreat provides time away from family, work, and church responsibilities, and allows participants to enrich their souls, nourish their spirits, and embrace the Lenten season. Each participant is asked to bring one item to share which represents a definer in their life. Some suggestions are a photo of a dearly loved grandmother, a childhood toy, a piece of jewelry, a family heirloom, a treasured book or Bible, etc. The cost for the Day Retreat is $55 a person and is payable to the Pittsburgh Mercy Parish Nurse & Health Ministry Program. The cost is an extra $40 for participants who choose to stay overnight on Friday (dinner on your own) and is paid directly to Martina Spiritual Renewal Center. Space is limited for overnight participants, so early registration is encouraged. Handicapped accessibility is available upon request. For more information about our Spiritual Retreat, please contact us at 412-232-5815. The Pittsburgh Mercy Parish Nurse & Health Ministry Program is hosting five Faith Community Nurse & Health Ministry Educational Meetings in Allegheny and Beaver counties that will provide two contact hours for registered nurses and valuable information for others who attend. This educational offering, “Spiritual Care of the Elderly with Dementia,” will focus on understanding dementia and the collection of symptoms that are caused by disorders affecting the brain. Participants will explore the roles of faith community nurses and health ministers as they offer spiritual care to those parishioners/congregation members with dementia and their family caregivers. The meeting can benefit faith community nurses, health ministers, registered nurses, licensed practical nurses, clergy/laity, and anyone interested in learning about wholistic care approach (whole-person health) and committed to educating their local parishioners. The goal of the meeting is to emphasize the importance of networking, fellowship, learning, and peer support for faith community nurses and health ministers as they assist their congregations and local community to better whole-person health – body, mind, and spirit. The meeting is free for those who do not wish to receive continuing education credits and $10 for registered nurses who want the educational credits. A check or cash are acceptable at the door. Light refreshments will be provided. Explore various religious objects that may have spiritual and emotional significance as one’s cognition declines. Registration for all sessions begins at 5:30 p.m.; the program runs from 6 to 8 p.m.
Penn Hills: Monday, May 20—Zion Lutheran Church, community room, 11609 Frankstown Road, Pittsburgh, PA 15235. McCandless: Thursday, May 30—Southwestern Pennsylvania Lutheran Synod, Chapel Area, 9625 Perry Highway (intersection of Route 19 and Ingomar Road), Pittsburgh, PA 15237. Use upper parking lot, accessible from Ingomar Road. Bethel Park: Thursday, June 6—Christ United Methodist Church, Conference Room A105, 44 Highland Road, Bethel Park, PA 15102. Enter church building door No. 2 under portico. Aliquippa: Wednesday, June 12—Saint Francis Cabrini Catholic Church, basement area of Rectory Meeting House, 115 Trinity Drive, Aliquippa, PA 15001. Pittsburgh (Uptown): Wednesday, June 19—UPMC Mercy Hospital, Sr. M. Ferdinand Clark Auditorium side A, 1400 Locust Street, Pittsburgh, PA 15219. Use hospital parking garage and ticket will be validated. While attending the location nearest to one’s faith community is suggested to benefit from peer support and local community resources, participants are welcome to attend the session that best suits their schedule. The University of Pittsburgh Medical Center (UPMC) is accredited as a provider of continuing nursing education by the American Nurses Credentialing Center’s Commission on Accreditation (ANCC). A participant must attend the entire session and complete an evaluation form before being awarded a certificate and two continuing education credits. Partial credit is not awarded. UPMC and ANCC do not endorse any commercial products as a result of this CE activity. For more information or to register, contact the Pittsburgh Mercy Parish Nurse & Health Ministry Program at 412-232-5815 or email ParishNurse@pittsburghmercy.org.